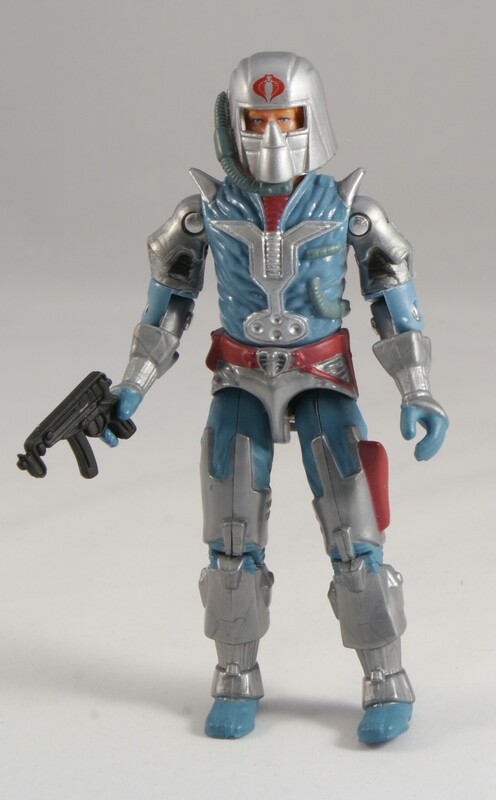 I’m not afraid to say that the 1987 Battle Armor equipped Cobra Commander is one of my favorite figure versions of the infamous enemy leader. When I picked up the figure back in ’87 (one of my last kid purchases of Joe toys) I found the concept interesting. I had not viewed old snake face as a front-line fighter, and the suit seemed like it gave him a new combat advantage. Being a Marvel Zombie, I also saw an Iron Man vibe in it, which was a plus. Once I delved back into the Marvel comic after a year’s break, I discovered that the Commander was not his old self but was being impersonated by disgruntled Siegie Fred VII, who had back-shot the true Cobra leader. This didn’t ingratiate me to him as a character and I didn’t feel too bad for him when the real deal came back from his seeming demise to exact revenge. 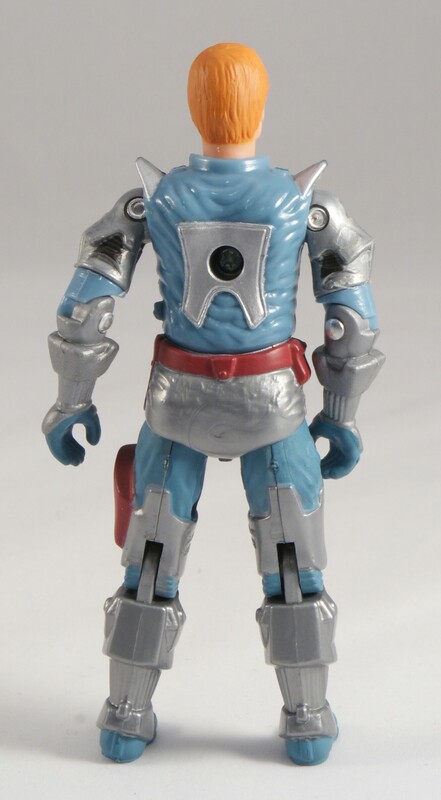 This comic pack figure recycles the body of the original, but features a new head with removable helmet. 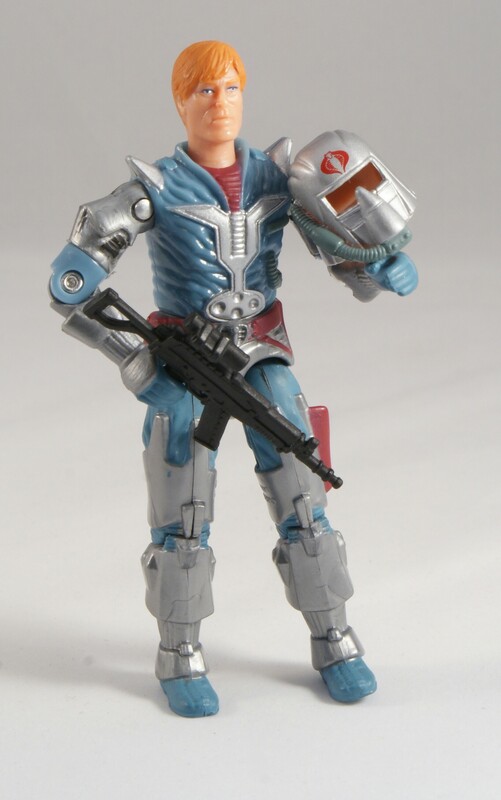 While I appreciate the unmasking component, the helmet design isn’t as striking as the ’87 version. However it is nice to get a Fred head sculpt and a variation of the battle armor that was featured in such a memorable run of the classic GI Joe comic. I disagree with you over the comic pack version helmet – it’s far more accurate to the comic art. I also prefer it to the original. Something similar happened in the IDW GIJoe ARAH comic recently when a high-profile character was killed. People went nuts and wanted it to be reversed, but so far Larry Hama is sticking to his guns. All comics have a tendency to generate hype by “killing” someone only to bring them back (comic movies are recreating this trend), but I think it makes for better storytelling to keep the dead DEAD. In Joe’s case, a new character has taken up the mantle of the dead one, which is working but not quite as natural as Fred’s replacement of Cobra Commander. The intrigue was fun (who’s gonna find out? ), and had he kept the position, there’d always be someone else looking to depose or assassinate him. About the figure: it’s alright, but it won’t replace the original version (I’ve grown to like the ’97 blue one actually). The smallish Fred head isn’t scaled as I’d like, but kudos to Hasbro for creating it. I have a theory that the original Cobra Commander did die. The CG spying on Fred recovered the body and with other loyal guardsman they cloned a new Cobra Commander, one programmed to hate Billy and dispose of anyone who’d resist him or suspect the truth. This is set up by Mindbender and Raptor planning to clone the commander themselves. Could’ve been a revelation but wasn’t. I agree with Yelnats. This figure is very accurate when comparing it to the comics. However, it is not better than the original. I like them both and each has a firm seat in my collection. I have often thought about doing some type of casting project with the head of this figure and the assorted unmasked Crimson Guard figures from these same years, while at the same time making a head for this body the like the “real deal’s” look back in those issues. I stocked up on these when they hit clearance. I’ve got a few repaint era CG’s and Crimson Shadow Guards with the heads and they look really nice. Between that and the rifle, this is a strong release for the comic packs. The Zartan he came with is decent enough. But, the Zarana is fairly weak. The blue shoes and armored briefs (too cheap to paint the pants parts on the waist?) are disappointing. As is the lack of the original pistol (not that ones are hard to find). The plus side is that the helmet doesn’t have an easily lost air hose. It did keep the annoyance of casting the helmet in flesh colored plastic. I did like Fred VII, despite the original CC being gone. The idea of the guy taking his place, being in way in over his head, and then conspiring with the Baroness all worked for me. Having Fred not know what he’s doing was fun.